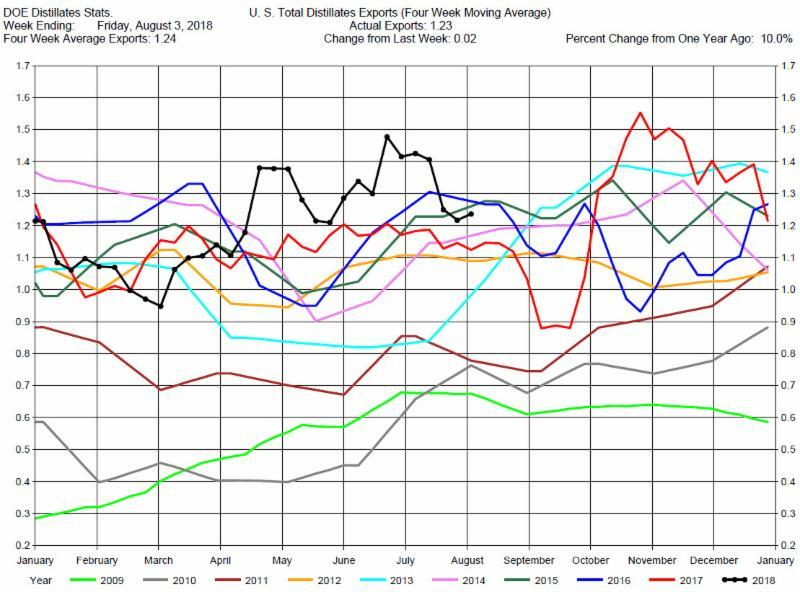 The DOE reported Total Crude Oil Inventories decreased by 1.4 million barrels to 407.4 million barrels for the week ending August 3, 2018, expectations average was for a 3.1 million barrel decrease. 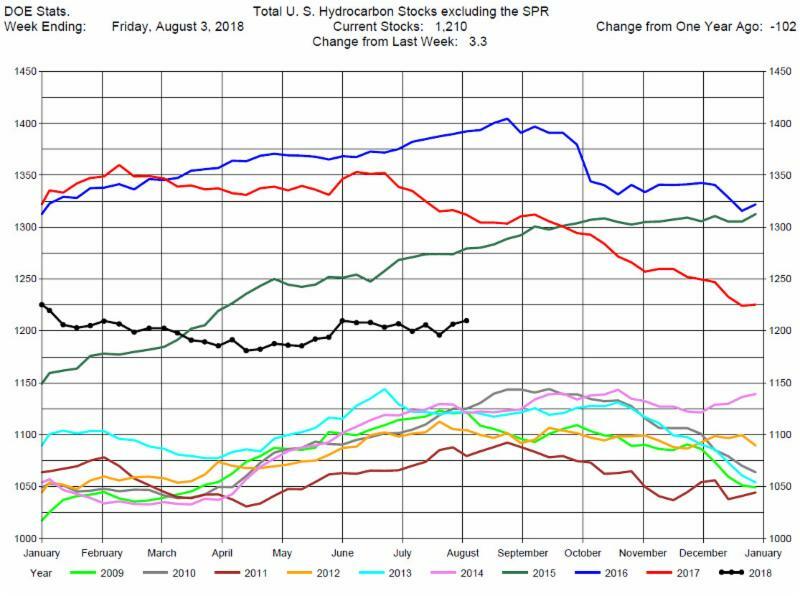 Overall hydrocarbon supplies increased by 3.3 million barrels to 1,210 million barrels. 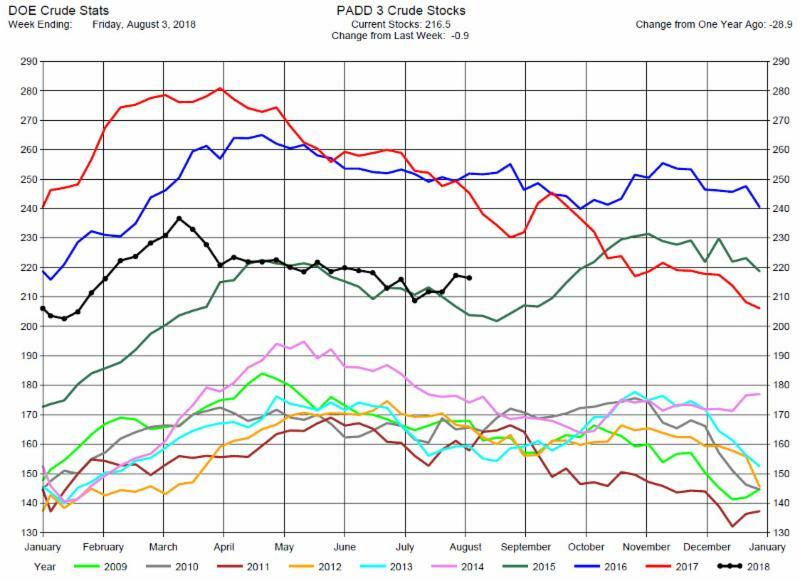 Crude Oil Production was off slightly by 100,000 barrels per day at 10.8 million barrels per day. Total Crude Imports were up 200,000 barrels per day to 7.9 million barrels per day. 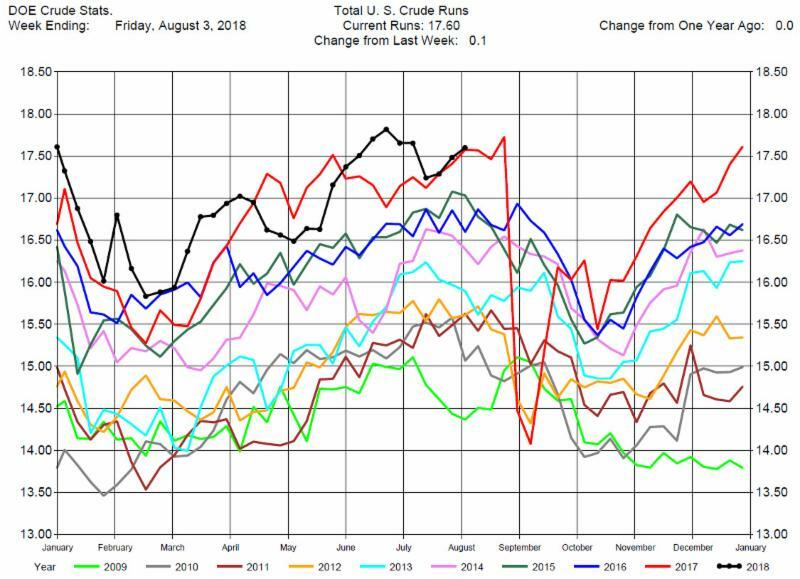 Total Refinery Crude Runs were up 100,000 barrels per day at 17.60 million barrels per day. 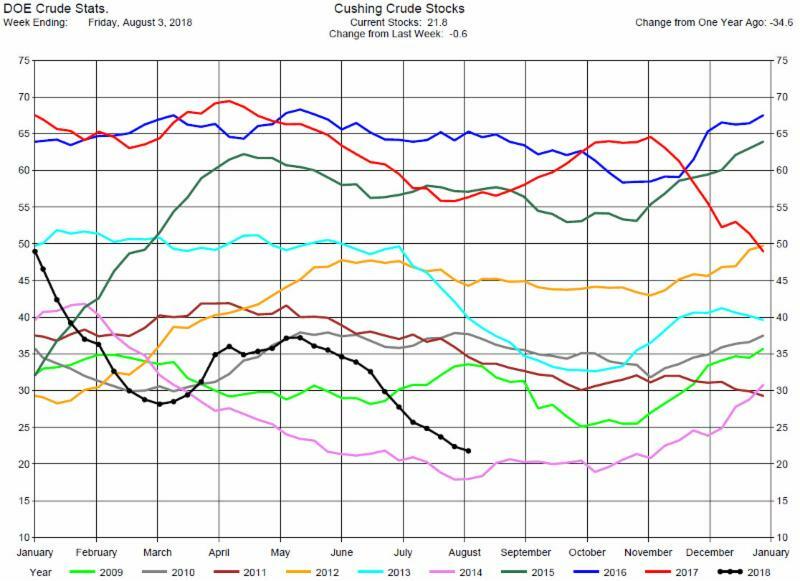 The Crude Oil Stocks draw was puzzling. 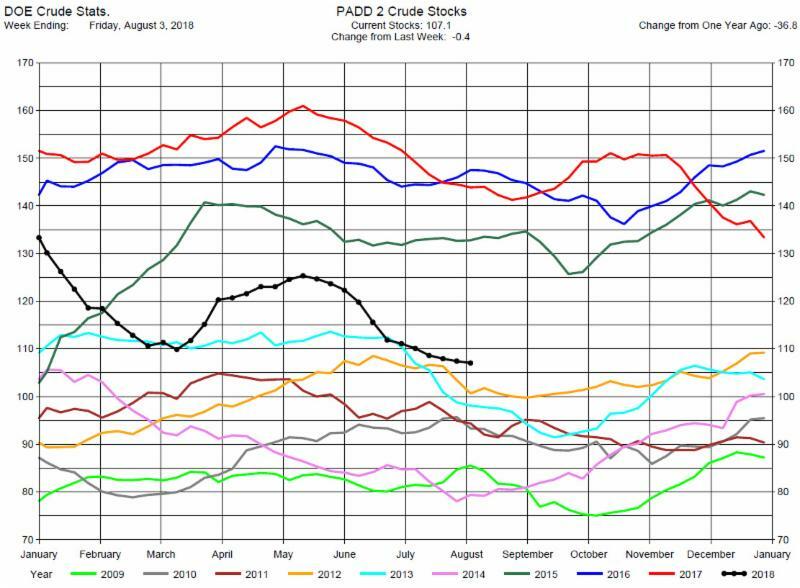 Crude Oil Production was 10.80 million barrels per day, Imports were 7.93 million barrels per day, and Exports were 1.85 million barrels per day, so the net Crude Oil supply was 10.80 + 7.93 – 1.85 = 16.88 million barrels per day. 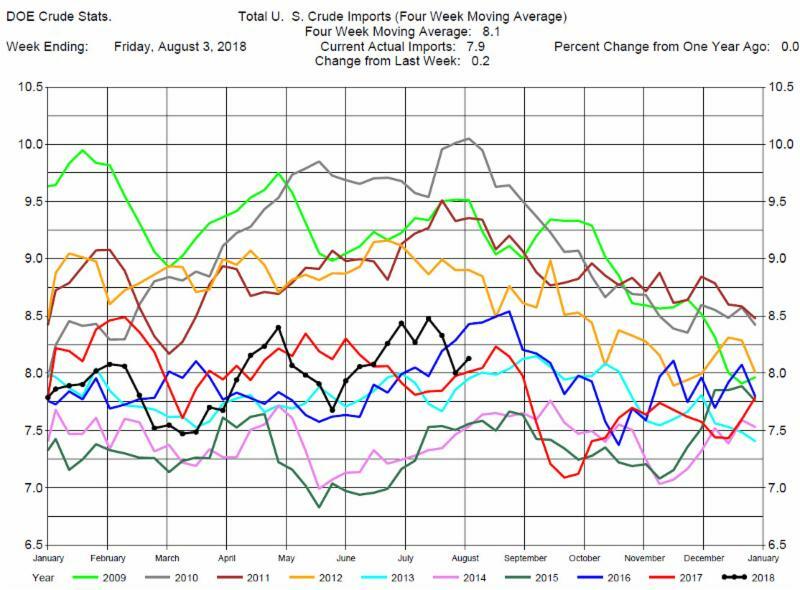 Crude Runs (demand) were 17.60 million barrels per day so the implied net draw was 16.88 – 17.60 = -.72 million barrels per day, or a 5.04 million barrels decrease for the week. The DOE reported only a 1.4 million barrel decrease. The discrepancy in the numbers is often referred to as “lost” barrels that were not counted in the weekly DOE survey. Often, corrections or adjustments in the data are reported in the subsequent data reports. For the trading day, the low Stocks draw was viewed as bearish to price. Prices traded lower throughout the day, ending down around $2.25. Prices are also currently driven by geo-political news headlines (China demand, Iran sanctions) so the market is choppy and range bound. We maintain our suggestion to not take trade positions in the near term and wait until a confirmed price direction is established. 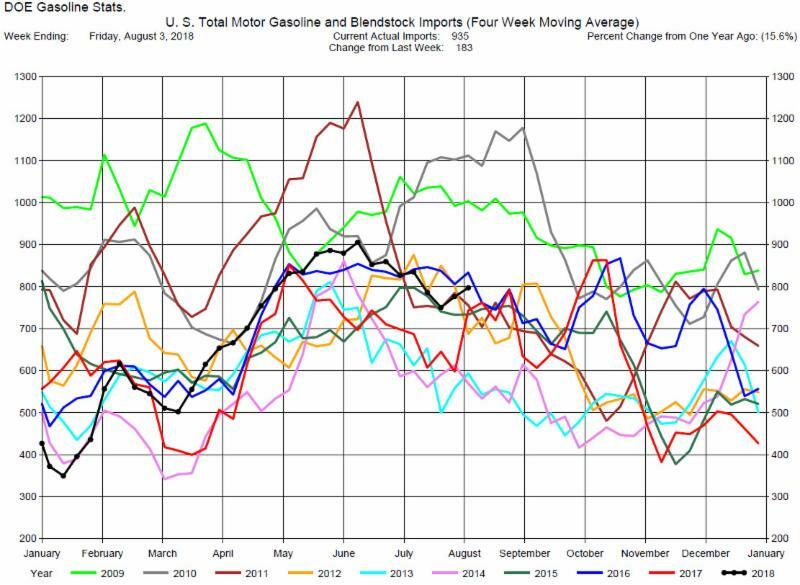 Total MotorGasoline Inventories increased by 2.9 million barrels to 233.9 million barrels for the week ending August 3, 2018, average for this time of the year is a 600,000 barrel decrease. 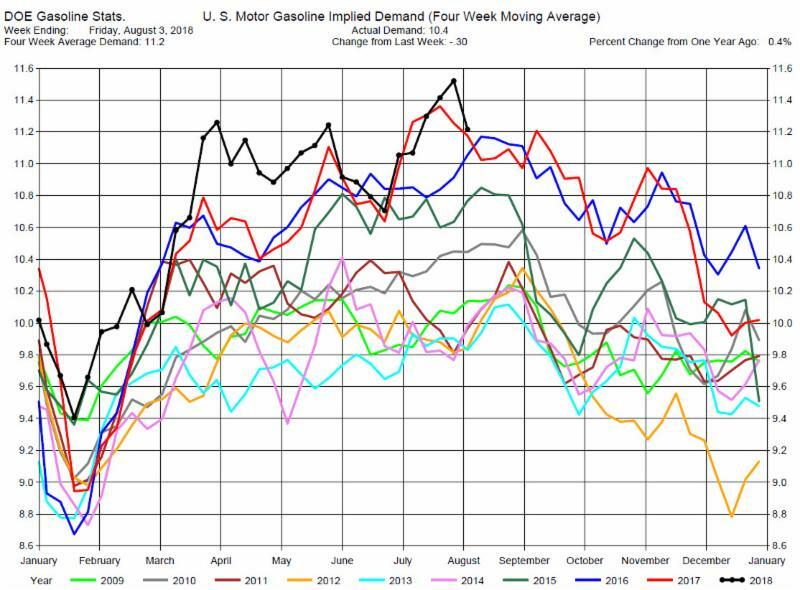 Implied Demand was off by 300,000 barrels per day to 11.40 million barrels per day. 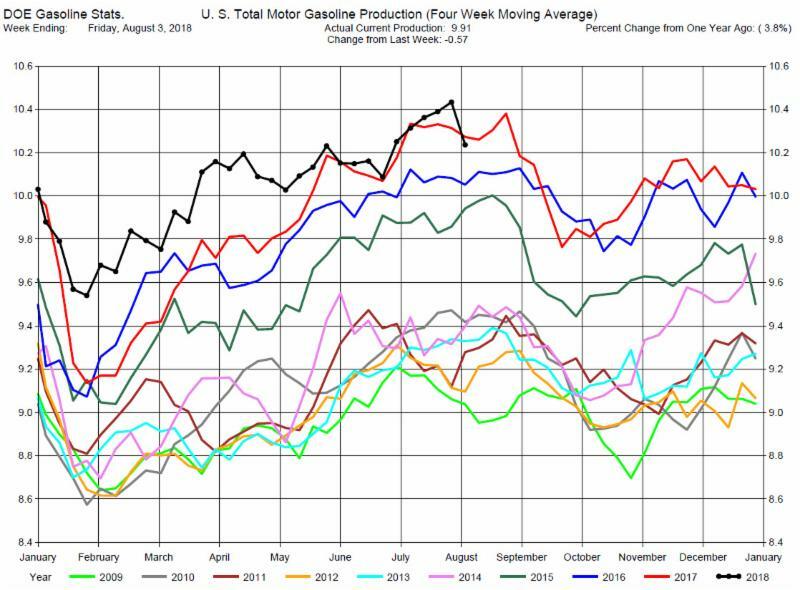 Gasoline Production was down 570,000 barrels per day to 9.91 million barrels per day. 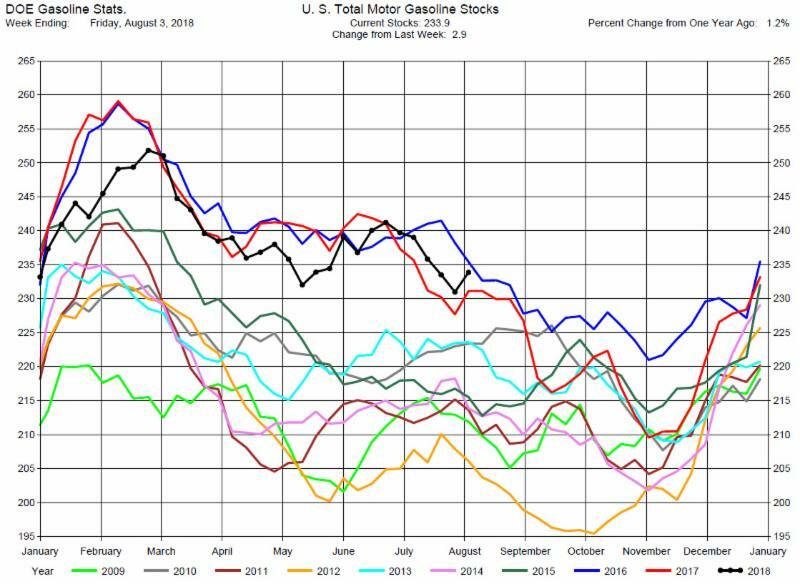 Despite the choppy behavior of crude oil prices, the gasoline crack spreads and calendar spreads have improved, so we still suggest considering long positions in the cracks or calendar spreads. 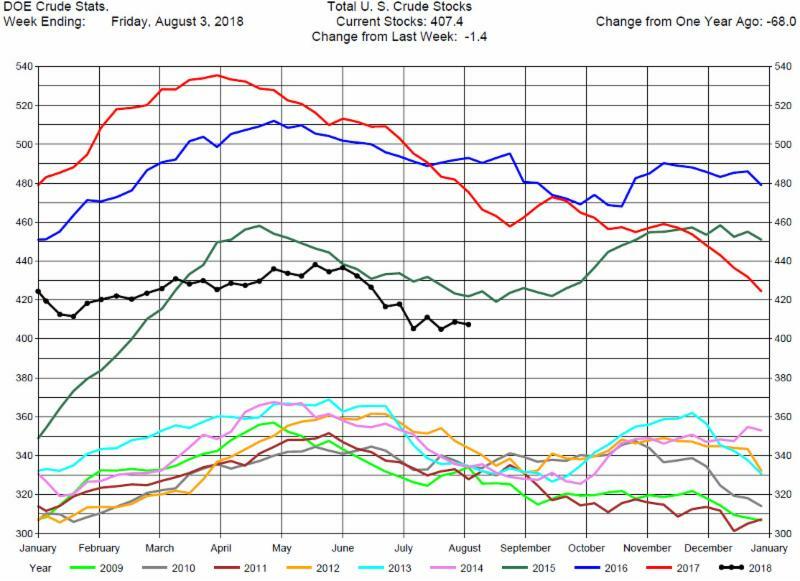 Total Distillates Stocks increased by 3.0 million barrels to 124.2 million barrels for the week ending July 27, 2018, average for this time of the year is a 200,000 barrel draw. 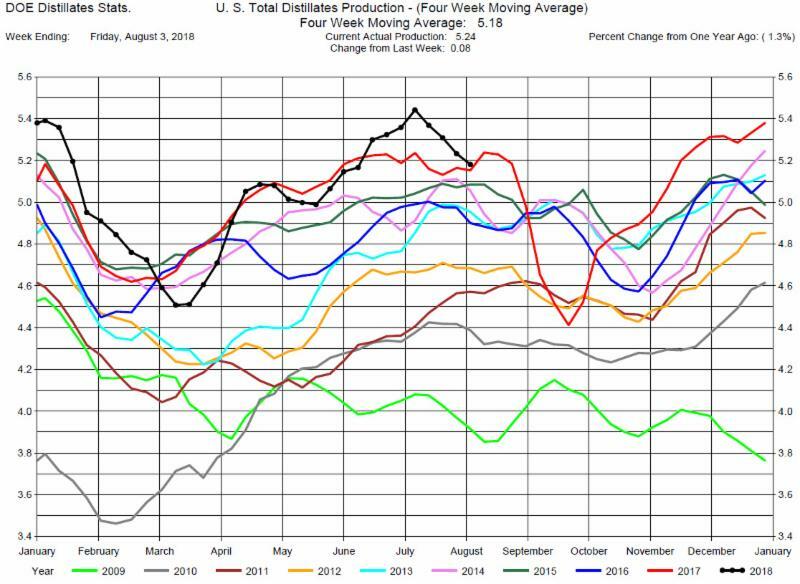 Total Distillates Production was up only 80,000 barrels per day to 5.24 million barrels per day. The four week moving average continues to decline. 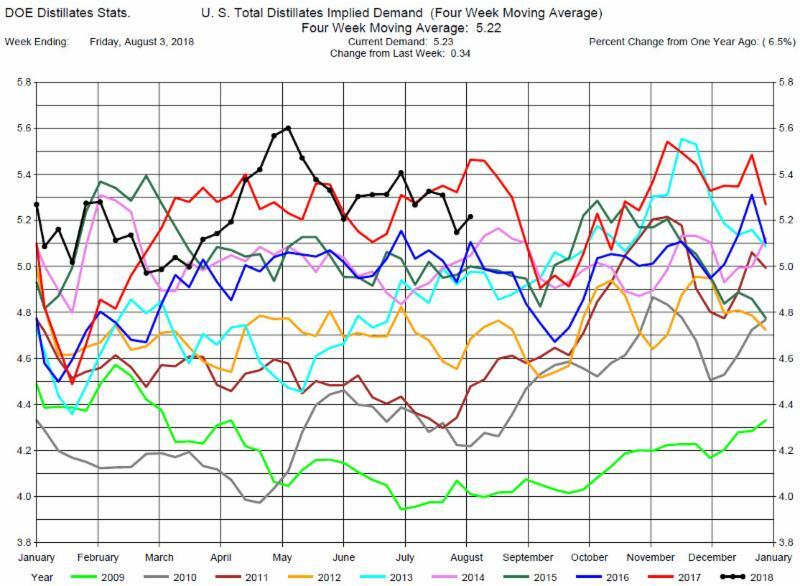 Total Distillates Implied Demand increased by 340,000 barrels per day to 5.23 million barrels per day. 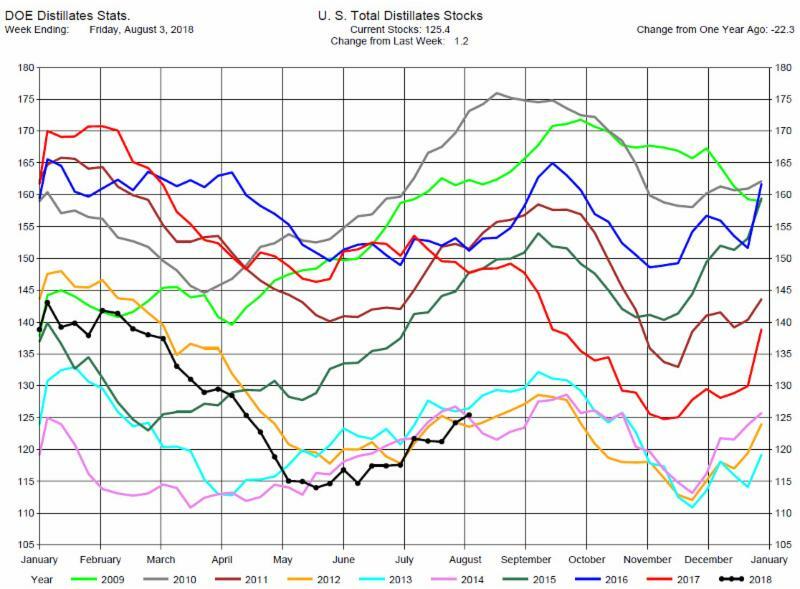 Distillates Production has declined in recent weeks and Distillates Demand has been strong enough to keep Distillates Stocks at seasonal lows. We still view this as a bullish scenario and suggest traders consider heating oil cracks or calendar spreads as a bullish opportunity.